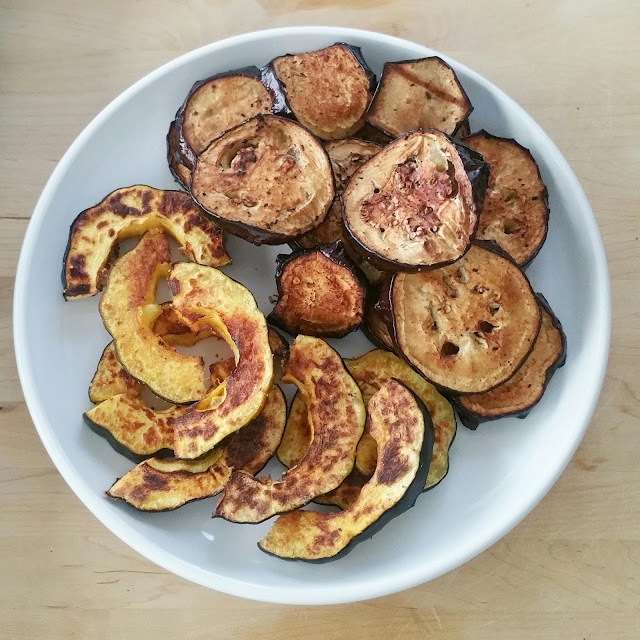 I love roasted veggies and these 2 are one of my faves. So easy to make and they take very little prep. I make them to snack on but also as a side dish. Below are the recipes for both. You can prep and cook them together as long as you cut them the same thickness. Before you begin, preheat the oven to 375. Slice the egg plant, cutting off each end, into slices about 1/2 inch thick. Place them in a Tupperware container and marinate for a few minutes in balsamic vinegar, splash of lime & your favorite seasoning. Slice the acorn squash, cutting off the top first, into slices about 1/2 inch thick. Once you see the inside, scoop out the "guts" as I call them. The seeds and lose interior. Continue slicing until you've sliced the entire squash. Spray a cookie sheet or a baking rack on top of a cookie sheet with olive oil or any non stick spray. Place the acorn squash on top. Then sprinkle lightly with your favorite seasoning and I also like to add a little parmessan cheese. Then place the eggplant on the sheet or rack and bake for about 30 minutes or until they're golden brown. I like to use a baking rack so I get the grill marks and it resembles BBQ roasting vs oven baking but both are fine and turn out just as yummy! Hope you enjoy them! I make these every week!